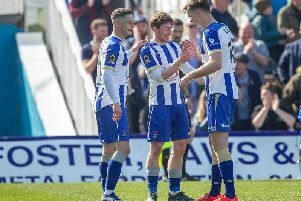 Away from the pressures of the lower reaches of League Two, Jake Carroll believes Hartlepool United can kick-start their season with a taste of cup success. Three defeats on the bounce over the last few weeks has seen Craig Hignett’s men slide down the fourth tier table. As things stand they sit just a point above the drop zone. But the stresses and strains of the league have been put to bed for a little while, at least, says Carroll, whose side face Stamford in the FA Cup tomorrow, then Rochdale in the Checkatrade Trophy on Wednesday. And the defender reckons that Pools can use this little mid-season break to get back to winning ways. “This game has probably come at the right time for us,” he said. “This could be just what we need to kick-start our season. “We have had some really good games and some good moments but in recent times we have let ourselves down. Pools are yet to win a home game this season. In fact, it is a run that stretches back to April and the victory over relegated York City. Success, at any level, is often built on making your home ground a fortress. So really is should come as no surprise that Pools are struggling this season, given their poor record at the Northern Gas & Power Stadium. Carroll believes there is little excuse for Pools not to win this weekend. He said: “There are no excuses. “We are all desperate to get that first home win. “But in saying that Hartlepool lost to non-league opposition just a few years ago. “We will be wary of that, as we were last year when we played Salford last year. “That went close. They pushed us all the way. We will have that in mind against Stamford. On the club’s recent form, Carroll continued: “I can’t deny we were not down after last weekend. We were. “Once everyone has had their say when the emotions are high then it calms down. Then you move on and look forward. One of the hardest things about games like this can be mental preparation, says Carroll. Last year Pools scraped through against Salford, the year before against Blyth they were not so lucky. Carroll hopes this time around the squad can get the balance right. “Mentally it can be tough,” he said. “No one can act as if we are going to stroll it. “Everyone has to have the right mindset about them. “It is no good us turning up against the teams at the top of our league and then not bothering against Stamford. It can’t work like that. Pools defence has taken up a fair few column inches in recent weeks, and Carroll says they deserve every bit of criticism that has come their way. This is because despite some bad luck, Pools have not been anywhere near good enough defensively. “We have had some bad luck but we have also made some bad decisions. It is a bit of both really,” he said. “We can’t do much about the luck, but the decision making has to improve. Until that does we will continue to drop points.